I call my finding a blunder because as a company built on “do no evil”, I cannot believe Google would allow this to happen. The Google AdWords Specialist I contacted was not even aware of what I am about to show you. This blog is a must-read for any local hotel in the US looking to capture both international and domestic clientele or looking to further protect their hotel brand, as what I am about to show you will simply astound you in terms of how a company like Google is failing, despite its technical and research resources. 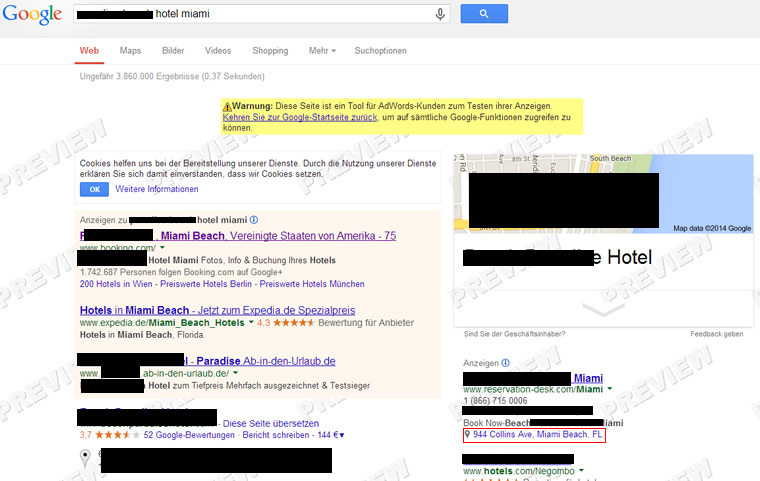 Here is the great Google adwords hotel blunder. In my example, I changed the domain to DE and the location to Berlin, as I wanted to see what the Google AdWords would look like in Berlin, Germany. Choose any country—FR (France), SE (Sweden), but remember to change your location to a city in that particular country. If you are US based company, I would also do a search on google.com to check your US listing. I chose a Hotel in Miami, but for your particular hotel, type in the [full hotel name] and also the [full hotel name + city] to get the best results. What I discovered through Ad Extension manipulation, the OTA was allowed to insert a totally different physical address into their ad for that particular hotel. Even though right above and to the left Google had the correct verified hotel address listed. The manipulation of the ad extension within Google Adwords is a blunder of epic proportion. Surely a company with unlimited resources, the brightest and smartest brains in the universe all pledging allegiance to do no evil can prevent these suspect practices. In the one example, the potential traveler is being misled into believing that the ad is a verified hotel address. Just think of the guest taking down the address and booking a taxi at the airport only to end up at a different location or booking a rental car and checking Google maps to find a location which is not even the correct hotel. The negative possibilities are endless here! 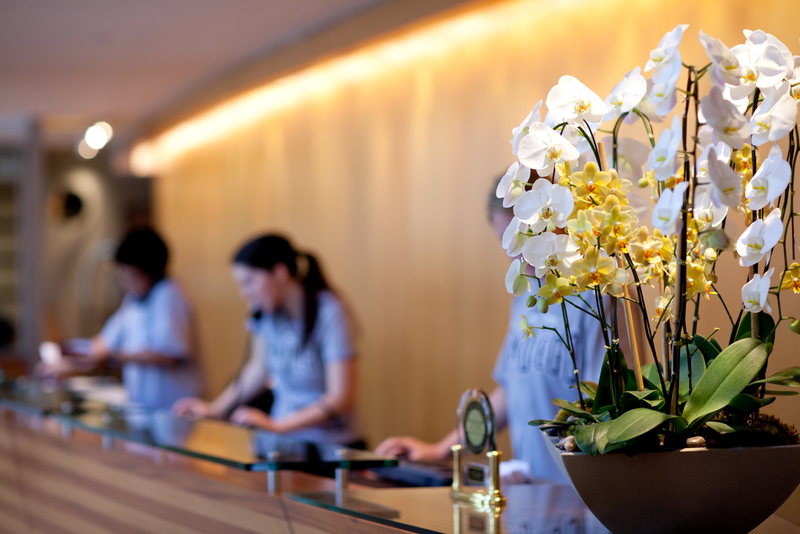 As a hotel owner or marketer, you’ve got to protect yourself or client. The simple fix for the hotel address issue if you are in the US is to call the Google Ads team from 9:00 a.m. – 8:00 p.m. EST, Monday through Friday at 1-866-2GOOGLE (1-866-246-6453) and raise HELL. If you are outside the US look at Google’s support page for your local Google number – https://support.google.com/adwords/answer/8206?hl=en. 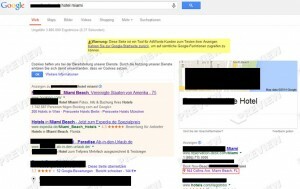 Also in this blog http://www.blueinteractiveagency.com/seo-blog/google-and-online-travel-agents.html, where they spoke about protecting your hotel name from Dynamic Keyword Insertion with a trademark so you can file a trademark infringement complaint with Google – https://services.google.com/inquiry/aw_tmcomplaint – against the offending OTAs. Google will investigate and if the OTAs are found in violation they will no longer be allowed to run ads using your name. Google AdWords’ Quality Guidelines – https://support.google.com/adwordspolicy/topic/1308145 – clearly state, “When people click on our ads, they trust us to deliver them to a destination that’s relevant, original, and easy to navigate.” How is having deceptive practices like OTA impersonation of a hotel and using the wrong address of the hotel attached to an affiliate commission-earning website helping to deliver an ad the user can trust? DISCLAIMER: I have blacked out this above mentioned hotel as they politely ask not to be mentioned in this case study.